If you’re more advanced, you definitely want to make this workout more intense by adding resistance. You can easily do all the exercises in this workout by adding resistance bands. If you have access to a gym, you can also try the thigh abductor machine. That’s honestly one of my favorite machines whenever I go to the gym. The workout video is provided at the end of this blog post. It includes the 3 best exercises for wider hips and fixing hip dips. You do 20 reps of each per leg. Then you get a 1-minute break and repeat for a total of 2 sets. Are Hip Dips Good or Bad? Before I go any further, I just want to clarify that there is nothing wrong with having hip dips. Although I have personally reduced my hip dips a lot through exercise, there is nothing wrong with having them! It is natural for most women. However, I understand that many women don’t like hip dips. So I definitely understand the desire to fix hip dips. After all, like I said, I worked on mine and I’ve seen some great results! So, without any further ado, here’s some extra information and tips to get wider hips and fix your hip dips. Hip dips are actually a normal part of the human anatomy. This is why there is absolutely nothing wrong with having them! Hip dips are most likely to occur in people who have high hips (like myself). And so many other creative names! Even men have hip dips! Did you know? 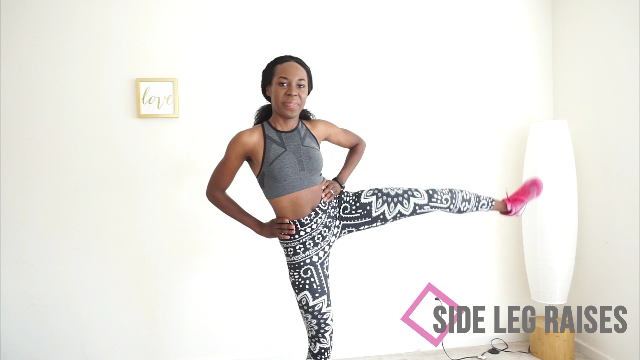 There are 3 common solutions to hip dips. With this solution, a medical professional grafts fat into the depressed area of the hips to create a rounder, fuller look. I think I can safely assume that this is not a realistic solution for most people. This leaves tricks and exercise – which are covered in the remaining tips below. When doing side leg lifts, wear ankle weights to increase the intensity. Choose from one-pound to eight-pound ankle weights. You can make squats more intense and effective by using dumbbells. Choose from 5 to 45-pound dumbbells, taking care to increase weight gradually. Remember to exercise about 3 times a week to get the best results. This tip for fixing hip dips falls in the “tricks” category. In my opinion, there is plenty to stress out about already. Why add hip dips to the mix? If you’re in a pinch, just grab some Spanx and call it a day! Opt for something high-waisted to emphasize your waist. You can also wear nice prints. Prints have a way of covering up a multitude of sins! Doing so is not only effective in hiding love handles, but also hip dips. This also creates the illusion that you have wider hips and an hour glass figure. Your jeans don’t have to be loose. But they also shouldn’t be so tight that they emphasize your hip dips. Also, opt for thicker, higher quality material.